Join us on October 6, 2017, from 5 - 9 p.m. for a campus-wide panorama of multidisciplinary talent as the UNLV College of Fine Arts unites to celebrate the University’s 60th anniversary. Representatives from the schools of Architecture and Music, the departments of Dance, Film, Art, Theatre, and the Entertainment Engineering & Design program will ensure this is a night to remember. Guests are invited to begin their evening at the Marjorie Barrick Museum of Art, where they will enjoy hors d’oeuvres and refreshments courtesy of Chef Jainine Jaffer of Painted Plates, while CFA Dean Nancy J. Uscher leads a champagne toast to the Las Vegas arts community ( 6 - 7 p.m.). The Museum - which celebrates its 50th birthday this year - is exploring fresh boundaries with two new shows, Preservation and liminal. From 7 - 9 p.m. we embark on a series of art walks across the campus lawns to the Donna Beam Fine Art Gallery and the Jessie & Brian Metcalf Gallery where a pair of complementary exhibitions, "Center for Land Use Interpretation: Peripheral Flood Control Structures of Las Vegas" and Mikayla Whitmore’s "There Is No Right Time" add further dimensions to the experience of the night. 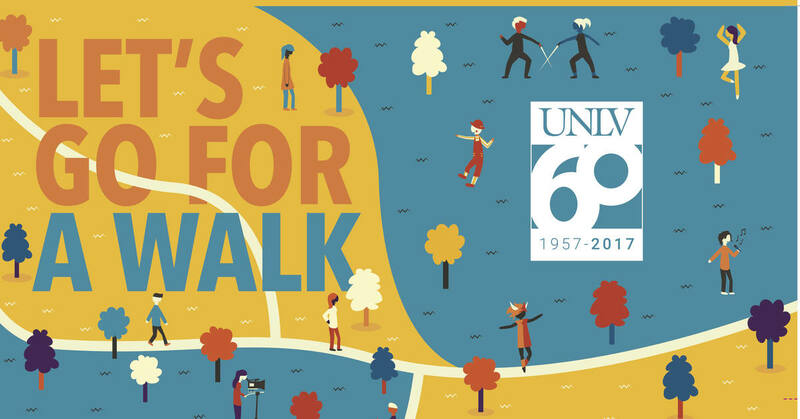 During the walk we encounter vocal performances, live jazz, and experiments in contrasting forms of dynamic movement from the School of Music and the Department of Theatre. The Department of Film demonstrates its behind-the-scenes production skills, while the School of Architecture and the Architecture Studies Library invite you to sculpt, scan, and walk through virtual landscapes with an augmented reality sandbox, and laser scanning. The Department of Dance brings new energy to original works by influential choreographer Erick Hawkins. Selections from Jules Perrot’s 1845 ballet "Pas De Quatre" and improvised dance to the sounds of a marimba band help us round out the night. Come and savor the arts at UNLV in this all-inclusive celebration. Staff, student, and metered parking will be free of charge. We hope all of you will join us for this joyous fall event!